The photos on these pages are courtesy of Ryan Snooks. 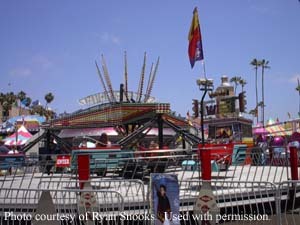 Ray Cammack shows provided this Kamikaze for the midway. Steve Vander Vorste's Reverchon Crazy Mouse was a huge hit at the fair. 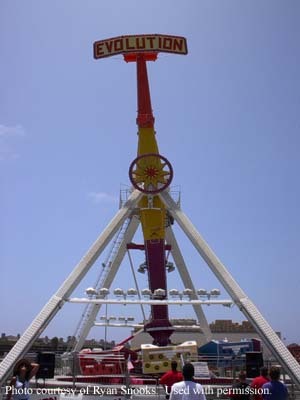 The other large coaster was the Miler Coaster Company's Hi Miler, owned by Ray Cammack Shows The ride, which is over twenty-five years old, is full of airtime and provides an intense experience. 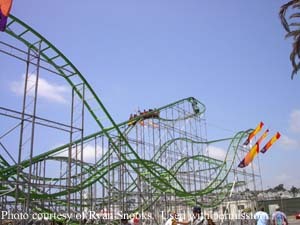 The Sound Wave, a Mack Raupenbahn, is one of the few traveling the country. 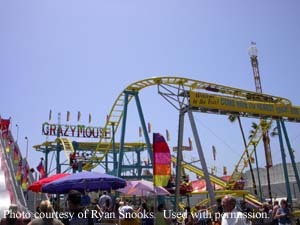 Ray Cammack Shows takes great care of this unique attraction, which is a throwback to the old Allan Herschell & Harry Traver caterpillar rides. 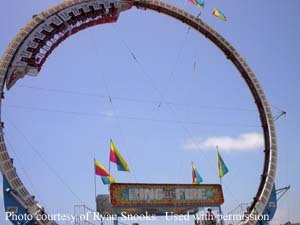 The Larson Ring of Fire, owned by B&B Amusements, was accented by pastel flags. 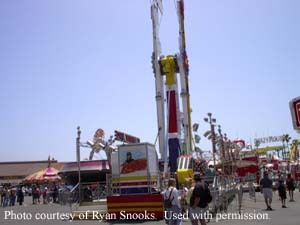 The Twist, owned by Ray Cammack Shows, is a new take on the classic Scrambler ride. Caprice Entertainment provided the unique Fabbri Hard Rock. This is one of three Hard Rocks in the world and the only one in the U.S. 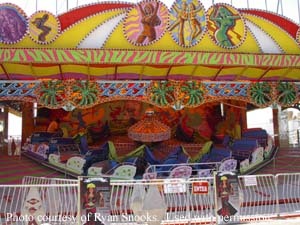 It spins riders in many different ways and gives a great ride because it is manually run. 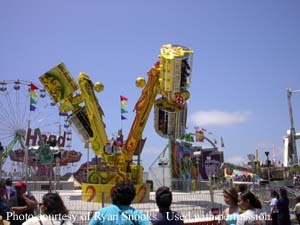 Bishop Amusements' Fabbri Evolution is a great super spectacular It breaks down on two trailers, but you wouldn't know it from the size of the attraction This ride looks massive on the midway.